Warning: Improper use of the sudo command could lead to data loss or the deletion of important system files. Please double-check your typing when using sudo. Type “man sudo” for more information. To proceed, enter your password, or type Ctrl-C to abort. Now save and open a new Terminal screen. Run sudo bash and viola, you will get your new message. Enjoy. By default, the Software Update Service, long a part of OS X Server, is hidden. This indicates the service is not likely to be long for this world. However, many an organization still likes to leverage cooling off periods for their Mac fleet. To see the service, once you’ve installed the Server app, open the Server app and then from the View menu, select Software Update. You’ll then see the Software Update service. If you click off of the service and close the app, it will be hidden again. If you enable the service, you will then see it each time you open the Server app. We’ll get into enabling the Software Update service in a bit. Enjoy. OS X Server 5 (for El Capitan and Yosemite) sees little change with the FTP Service. Instead of sharing out each directory the new incantation of the FTP service allows administrators to share a single directory out. This directory can be any share that has previously been configured in the File Sharing service or a website configured in the Websites service. 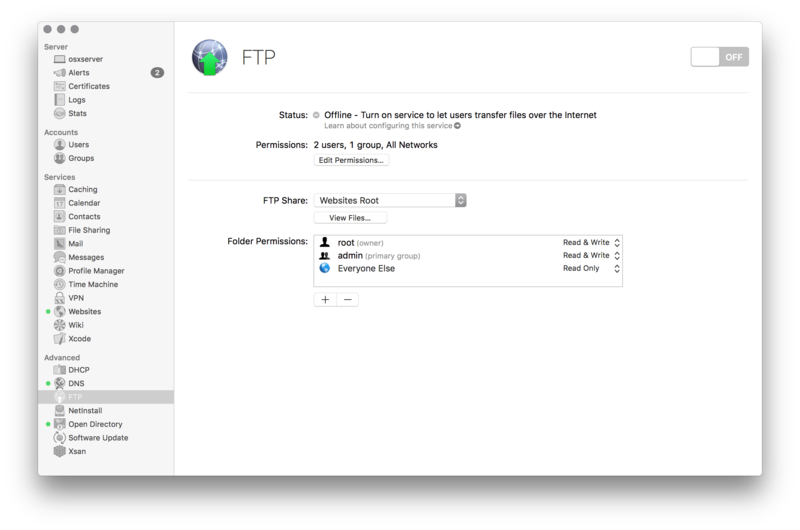 To setup FTP, first open the Server app and then click on the FTP service. Once open, use the Share: drop-down list to select a share that already exists (output of sharing -l basically) and click on one of the shares or Custom to create a new share for FTP. Then, set the permissions as appropriate on the share and hit the ON button for the FTP service. Now, let’s test from a client. I like to use the ftp command line interface built into OS X. To test, type ftp followed by the address of the site (and I like to put the username followed by @ before the hostname, as follows: ftp robin@elcapserver.krypted.lan When prompted, provide a password. Then, assuming your get the following, you’re in: 230 User robin logged in. Mad Max Beyond Thunderdome teaches us that Tina Turner’s still got it – Bill Schroeder doesn’t have it, no relation to Ricky, he leaves the hospital part-cyborg with the first artificial heart. A View To A Kill finally ends the Roger Moore era of James Bond. Computer nerds, keep in mind, he saved Silicon Valley. This movie had Christopher Walken and Duran Duran. What more could you ask for? Oh, right – Tanya Roberts! Oh, and Thomas Patrick Cavanaugh actually gets life for being a real spy. British Telecom phases out red telephone boxes – almost as a result a single season of Dr. Who airs on TV. In 1985, Paul Simon, Stevie Wonder, Ray Charles, Bob Dylan, Michael Jackson, Billy Joel, Cyndi Lauper, Willie Nelson, Lionel Richie, Smokey Robinson, Kenny Rogers, Diana Ross, Paul Simon, Bruce Springsteen, Tina Turner, Daryl Hall, Kenny Loggins, Huey Lewis and of course Al Jarreau sang We Are The World. Prince wouldn’t show and Waylon Jennings stormed out. Jane Fonda hosted a HBO special in between workout videos. Live Aid happens too, and is far cooler. But, at least Rich Ramirez (the Night Stalker) got nabbed in LA.Top singles on the charts include Madonna, Wham!, Simple Minds, Duran Duran, Phil Collins, Dire Straits, Starship, Lionel Richie, Foreigner and REO Speedwagon. The Commodore Amiga is launched. The Free Software Foundation is founded by rms, author of great cookie recipes, tips on women and GNU Manifestos. So let’s put these in motion. First, let’s just look at all the disks available using the –enum option: pgpwde --enum OK, so disk 0 is my only volume and it’s bootable. Nothing has been encrypted yet. So let’s confirm by looking at –disk-status: pgpwde --disk-status --disk 0 Now, let’s see who’s got access to that disk: pgpwde --list-user --disk 0 Then, let’s enable BootGuard on our volume: pgpwde --instrument --disk 0 And then add user cedge to be able to unlock that volume, with a passphrase of krypted: pgpwde --add-user cedge --passphrase krypted --disk 0 And then let’s encrypt it: pgpwde --encrypt --passphrase krypted --disk 0 And finally, to change the password of that cedge account to something more secure: pgpwde --change-passphrase --disk 0 -u cedge --passphrase krypted --new-passphrase "!Ab@nK$Ru13z" To make scripting this a bit easier, you can also choose to skip the whole –passphrase option (since you might not know the current passphrase since they’re not typically reversible) you can use the –recovery-token option (assuming you have a token). Note: No passwords were hurt in the writing of this article. Using the firewall in Ubuntu can be as easy or as hard as you want to make it. BSD variants all basically use the ipfw command whereas most of the rest of the *nix world will use netfilter. Netfilter has a number of front ends; the one that comes pre-installed in Ubuntu is ufw, short for ‘uncomplicated firewall’. Ufw is good for basic port management: allow and deny type of stuff. It’s not going to have the divert or throttling options. So let’s look at some basic incantations of ufw (you need to have elevated privileges to do all of this btw). DEFAULT_OUTPUT_POLICY – Same as above but for handling outgoing traffic not otherwise defined by a rule. DEFAULT_FORWARD_POLICY – Same as above but for forwarding packets (routing). DEFAULT_APPLICATION_POLICY – I’d just leave this as the default, SKIP. MANAGE_BUILTINS – when set to yes, allows ufw to manage default iptables chains as well. Additionally, just disabling ufw will usually tell you definitively whether you are looking at a problem with a rule, allowing you to later look into disabling each rule until you find the offending rule. That is about as simple as iptables get. I’ll try and write up more on dealing with it later but for now you should have enough information to get a little wacky with some basic firewall functionality on Linux. Enjoy.